The American Civil War is unique in human history for being the only civil conflict that ended with reunion, respect and brotherhood. The most bloody national conflict in world history is defined, ultimately, not by the conflict itself and that conflict’s destruction, but by the preservation of the values of all Americans. The twin gifts of patriotic understanding and American freedom not only survived, but have thrived to make this nation a beacon of hope and peace the rest of the world admires to this day and will forever. This production is honored to have developed a connection between this ultimate American sport with the ultimate American story and is proud to announce an association between select NASCAR™ affiliated drivers and roles that best exemplify this tradition of patriotism and competition in our production. The connection between the Civil War and drivers who race NASCAR™ is simple: those values of the Civil War—the patriotism, the spirit of American competition, the regional and national pride that poured forth from and for its heroes—is best exemplified in the American Values and American Spirit embraced today by the NASCAR™ affiliated drivers and their fans. One of the few times I am speechless. But seriously folks, this is PERFECT; as a wise book I read/wrote once said–making the Confederate military experience as one part of the Patriotic American military experience is critical to understanding Civil War memory in the twentieth century. Yes, its about race and not vroom vroom. Are we really SURPRISED that the whitest sport in America would remember the CW in this way? You get extra points for that one, use them wisely. Scott – best comment ever. Ahh the Civil War… what better example of America’s love of fun and good-spirited competition? The ugly side of this is that there’s currently an active meme going around that all but says, “NASCAR is for white people.” The recent flap over whether the teevee car “General Lee,” with its big Confederate Battle Flag painted on top, could be featured at a NASCAR event in Arizona is just the latest in a long list of things that certain fans have pointed to as the PC-ing of motor sports and cultural genocideblahblahblah you get the idea. I noticed it a few months back, after that big, fiery accident at Daytona when Clint Lacy went off on an angry screed about who that incident somehow proved that NASCAR’s attempts to diversify the ranks of its drivers (and through them, fans) was destroying the sport. Never mind that the driver involved in the accicent, Juan Pablo Montoya, has been racing in NASCAR long before the diversity program was inaugurated, and is one of the best-known and highly respected drivers active today. More recently, Mike Tuggle at the League of the South has been banging that same drum about how the combination of political correctness and ethnic diversity are destroying an inherently Southern sport — in this case, as usual, “Southern” referring exclusively to white people. They never quite get around to saying it’s all those brown people they’re upset about, but then in the modern political/cultural landscape, bitching vaguely about “diversity” has become the accepted currency of bigotry. It’s depressingly amusing to watch the contortions they go to without ever quite having the stones to say what they mean. Civil War will destroy it’s meaning. Dead Dogma is the idea that if you do not know and appreciate the foundations of your belief, one day you will just abandon it. IMHO that is what has been happening to ‘Confederate Southern Culture’ since the politicians used it in the 1960/60s to oppose integration. As real history and experience are replaced by slogans and advertising, it becomes weaker and weaker. Maybe one day we will see flaggers with beer ad sponsor labels on the flag staff or tee shirt proclaiming “Buy Rebel Beer and celebrate your Southern Heritage”. 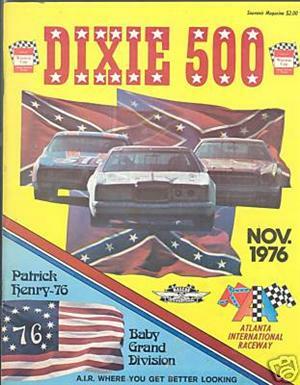 NASCAR got how America or some Americans thought about the Civil War in 1976. Neat. Well, NASCAR is a bunch of cars driving around in circle, and it seems like arguments with Southrons seem to go around and around in circles too. I guess they mean that spirit where people from the two sides try to viciously kill each other. The whole thing is obscene. I can’t say I’m shocked. That is what I expect to see. This is a bit off topic, but there is a fair amount of NASCAR bashing, “driving around in a circle”, going on here. First, I’m not a NASCAR fan but know several people who are. I am a sports fan and have been asked whether I thought it was a sport. My response: imagine driving at nearly 200 mph in rush hour traffic in which you’re not just trying to survive. You’re trying to get there first, and this goes on for hours while your competitors are using their cars to try to bump you out of the way and passing you just inches from your fenders. Now that requires quick reactions and lots of endurance. So yes, it’s a sport. Having said all that, comparing NASCAR to the Civil War is beyond reason and thus beyond words. Seems to me the concern is with how the producers of this series have characterized the Civil War. Thanks for the comment. I don’t have much interest in the sport, and it is sickening how this piece beautifies the War. Whether the final product will be any good is hard to say. It can hardly be any worse than Spielberg’s love letter to the Lincoln myth appears to be, based on an interview I saw with the screenwriter. You people need to lighten up. Seriously. And by the way, the “whitest sport in America” is not NASCAR, it’s ice hockey. Thanks for the comment, Allen. There are far more black NHL players than there are black NASCAR drivers, so that’s an ignorant comment. Indeed, the demography of the NHL is far, far more diverse than NASCAR. I didn’t say “the NHL”, Brooks. I said “ice hockey”. But since I follow neither sport, I’ll let you have the last word. A long-time NASCAR fan recently told me that attendance is down because of the sport’s recent opposition to fans flying the Confederate flag at races. I don’t know that I agree; the economy, market oversaturation, ill-conceived expansion, and lack of popular drivers who win probably have more to do with it. But there’s no doubt that the heritage community (including the SCV and Edgerton) have been calling for a boycott and flaggings since at least 2005, when Bill France spoke out against the practice. If Carl Edwards ends up playing John B. Gordon, it’ll be the producers’ decision, not NASCAR’s. Sure, and it’s reasonable to say that the sport is generally “Southern” in its origins. But as with everything else, some fools equate “Southern” with “Confederate,” effectively marginalizing themselves from mainstream society. Long before the first ‘shine runner in the Appalachians hit the road and well before NASCAR appeared, there was stock car racing in the United States. Contrary to the folklore and mythology, stock car racing is not a Southern invention. I suppose if southerners have to atone for NASCAR in 1976, northerners should at the very least retroactively apologize for disco. I cringed when I first read that as well. However, I’ve had a chance to see the script (and to re-write a tiny portion about the Battle of the Crater) and it is thankfully devoid of any Lost Cause hoopla. The USCT experience will be portrayed in greater detail than any other Civil War film aside from Glory, with the bulk of the attention going to the Louisiana Native Guard and the Crater. And even though I’m a historical consultant for the film, I promise I wasn’t paid to say that. Is Bo and Luke doing a camo?